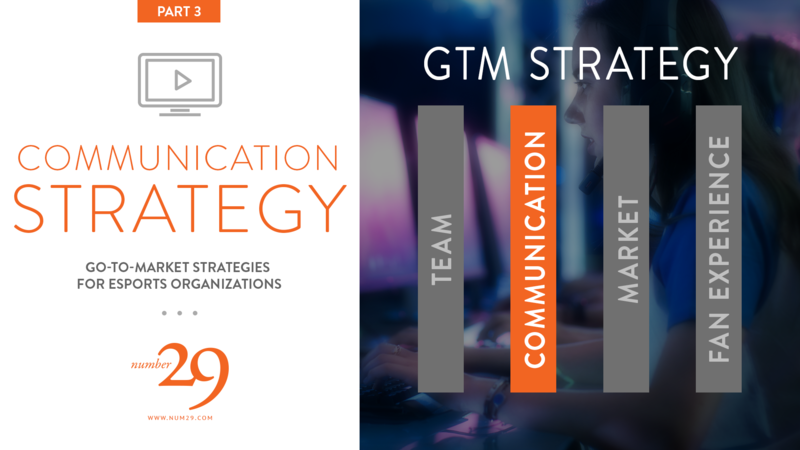 The second strategy pillar we will discuss in an esports team GTM strategy is focused on Communication. The decisions you made regarding your Team Strategy in part 2 should be informing the choices you will be making in terms of which marketing channels you should be leveraging for your Communication Strategy. This article is the third in a series ( Part 1 | Part 2 ) focused on esports marketing and go-to-market strategies. Throughout the month I will be looking at each of the pillars discussed in Part 1 and breaking those down into smaller discussions to help you identify what approach is right for your organization. The second strategy pillar we will discuss in an esports team GTM strategy is focused on Communication. The decisions you made regarding your Team Strategy in part 2 should be informing the choices you will be making in terms of which marketing channels you should be leveraging for your Communication Strategy. What is a Marketing Channel? Marketing channels are the platforms you will utilize to get your word out to your fans. Social media is your most important marketing channel, which can be divided into each platform you will utilize to reach your target demographics. Other channels to consider are podcasts, video, ads, live-streaming, events, influencers etc. * What is the team storyline? * How are you going to gain market visibility and steal mindshare from your competitors? * What promotions can you offer fans to make your team worth investing in both emotionally and financially? For the sake of your Communication strategy, I want to dig into the target audience and make sure we have a clear understanding of why knowing who these fans are is important. Your target audience is going to be a very important consideration when looking at what marketing channels you will be leveraging for your communication strategy. * Is there a particular region you want to target? * Is your target market on PC, Console, or Mobile or all three? * Is your audience predominantly male, or should you be targeting females as well? * What’s the target age of your demographic? Typically you would be looking at 14–35 years old, however, mobile games can bring in gamers upwards of 56 years of age. Is that important to your communications? The answers to these questions should be considered to determine which channels are going to provide the best bang for your buck to start with. While I would typically recommend leveraging as many channels as possible, knowing which channels will allow you to reach the demographic you are targeting will allow you to refine your communications. Location can be incredibly critical in terms of how you reach your fans if you plan to represent a region, or will be creating geolocated ads. If you are targeting prospective fans outside of the US, be sure to understand what platforms are available to those users. In China, you will want to leverage WeChat and Weibo.cn as much as possible for your community building efforts. For Southeast Asia, look at Facebook as the default platform of choice. Approximately sixty thousand Chinese fans on Weibo. I was unable to pull the stats for WeChat, but I’d venture to guess that’s even higher due to WeChat’s full penetration of China’s economic & social infrastructure. So, if you’re like me, you may be wondering how Shanghai Dragons Twitter can still have approx. fifty-four thousand followers, if what I am saying is true? As you can see here, the majority of fans on twitter are definitely based in the US, with small percentages spread through the rest of the world, with China representing the 12–18 percentile of followers. Target devices — PC, Console, or Mobile? Knowing where the majority of your fans are coming from not only allows you to understand how they are playing, but can also dictate how and where you want to be promoting, how that content is going to be consumed, and what sort of sponsors and promotions will appeal to your market. PC gamers are at home with multitasking and have desktop browsers at their fingertips, whereas mobile gamers are using their devices to watch streams and consume content. Console gamers are most likely utilizing a combination of mobile devices and PC due to few consoles offering a pleasant browser experience, other than watching twitch when they are not playing. Female gamers are becoming increasingly more prevalent and engaged in esports culture. I would recommend being very considerate in how you are communicating and understand that the female gamer is not only out there, but is a growing audience. While I haven’t seen many female audiences exceed 15% for most teams and competitive games, that is still a sizable chunk of your fan base. As a point of comparison, we can look at @ClashofClans, which actually is an outlier with a female fanbase of 19%. 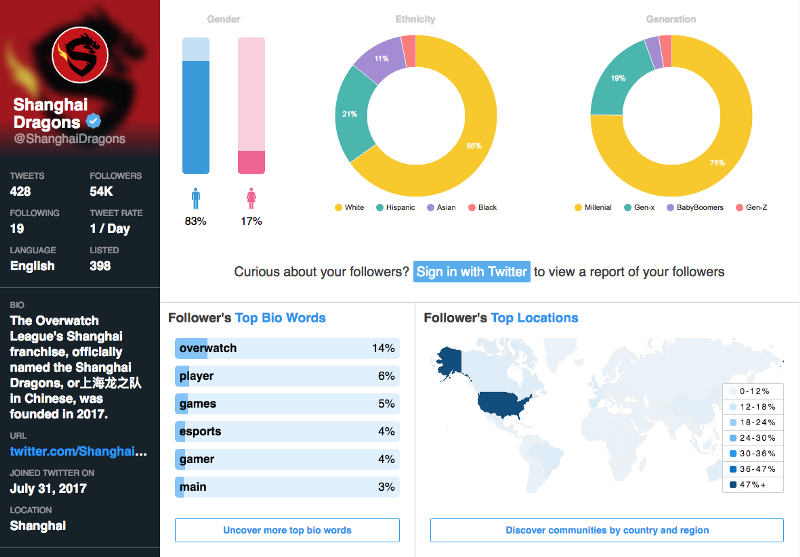 With a total twitter following of 4.3 million, that is still a female audience of ~817k fans. That is a huge female audience! Don’t neglect these fans. Target age is sort of a tricky factor. Knowing your audience is one thing, but knowing who you want as your audience is something else altogether. I actually thought this was something that the H1Z1 Pro League did pretty well this last weekend. Their pregame content (and to some extent the casting as well), was targeted to potential viewers that were not your typical gamer. Being broadcast on Facebook, they knew that they had potential to bring both an older audience and a larger than usual female viewership. They did a great job not only explaining the game and the battle royale genre, but also bringing in mainstream celebrities to speak to the strengths of gaming and esports. This communication strategy is aimed at bringing a wider demographic into the viewership, and not just catering to core gamers. Now that we have a better understanding of our target market, our decisions on platforms and communications can be more easily defined. Twitter: Strong in North America and Europe. Great for news and direct one on one engagement with fans. Facebook: Top Social Network in Southeast Asia. Large female demographic, with ages ranging from 18–56 years. Youtube: Team video content is a must. Building fans through storytelling, and engaging content. Tell human stories, not just gameplay vids. Twitch: a great channel for player based fan building from 14–36 years old. I do believe there is a lot of opportunities for teams to build brand specific channels, and leverage the Premier and Replay features to create more intimate viewing parties for brand engagement. Take your fans behind the scenes of your videos and have players sharing their experiences real-time with viewers. Engage one-on-one with your fans in real-time and give them something few teams are doing today. Or consider doing “behind-the-scenes” streams from your team house, while your players are practicing. Fans want this content! One aspect of your communication strategy that I think is really worth considering for organizations with three or more teams, is sub-channel segmentation. What I mean by this is breaking up your team communications into individual channels based on the game. For instance, having separate Twitter accounts for your Organization, your Overwatch team, your Super Smash team, and your Clash Royale team. I don’t think this is the right approach for all channels, but Twitter, in particular, can benefit from a more segmented approach to communication. One of my own biggest pain-points as a fan is following an Org because I like their Vainglory team, but then having to wade through all their other communications, trying to pick out which ones are relevant to me. Is this a CSGO post, or LoL, Clash Royale, Rocket League, etc? Organizations want to show large numbers of followers, to help provide value to potential sponsors and developers when being considered for partnerships. I get that. However, I’d argue that being able to show 100k followers, divided amongst 4 twitter profiles, segmented by genre is almost more valuable to a potential sponsor/affiliate. These are now highly targeted accounts that have a very clear demographic. Your Clash Royale team twitter of 35k followers is a mobile audience. They are younger, more interested in products that make their brand of gaming easier, and typically more social and are not constrained to gaming at home. You can now approach Anker about a potential sponsorship. You can show that you have 100k total followers, but 35% of those followers are targeted mobile gamers. You can send communications directly to that market segment without paying for ads. These means that you can almost guarantee increased engagement, with a higher sales conversion, with the right communications. I would still recommend a brand account as well. This still allows for cross-genre communications. Now your team twitter accounts can provide more of the play-by-play type tweets, with scores and matchups, and your organization twitter can provide more of the high-level promotional tweets. Save the dates, games times, sponsor messages, promotions, etc. So, is a mixed channel approach right for your organization? Marketing is hard. It’s easy for me to say, hey, break up your organizational comms into five Twitter accounts, and keep them all up to date, in addition to your Facebook account and your Youtube channel. The reality of that situation for most esports organizations is that they don’t have the resources or people to keep up with that pace of content. Team owners don’t really have the time to keep all that straight. Using volunteers has its own challenges. Not to mention creating graphics, animated gifs, and videos for all of these channels, with their different aspect ratios and limitations. And by the way, Twitch is requiring your players to stream 20 hours a week in order for you to get paid. If you are a new organization, sometimes it feels like you have to start with a minimum of a Twitter, Facebook, Instagram, Snapchat, Youtube, Twitch, Discord, Linkedin, and Telegram accounts. Not to mention building a website. But why? If you don’t have the resources to properly leverage those platforms to engage your fan base, then don’t. You’ve worked on your Team Strategy, and you are confident that a Twitter account is the right place to start for your target audience. Start building your fan base, and formulating your communications. Engage your fans with tweets and promotions. Find ways to leverage your limited resources to execute your communication strategy. You have a team video you want to tweet out? Now create a youtube channel, and post it there. You don’t have to have a clear youtube strategy in place yet, just use it to house your content. Over time your fans will come, and when you are ready you can create consistent content for that channel. As your fan base widens, and your management team grows, continue to add channels to your strategy. Revised your communication strategy, and expand your organizational footprint.